Nestled in the beautiful landscape of small, quiet mountain village of Víllora Bed is this where modernity and tradition are combined with skill to offer visitors a comfortable stay in a simple environment consisting predominantly of wood and natural colors and Queen hospitality and friendly treatment of Inma and Feli. Although newly built, the structure of the building follows the lines of the Castilian-Manchego wise architecture to provide a layout of rooms around a courtyard crowned by a huge skylight, which provides an invigorating sensation of light and space to the facility. The rooms have been carefully furniture, color and textiles to provide an optimum level of comfort and warmth without resorting to just decorative, nothing but the view from the landscape through the windows. On the ground floor and available to customers is a living room with fireplace, a bar-café with terrace and the restaurant "Essences," also open to the public, to enjoy a pleasant evening and a careful cuisine . An ideal place to enjoy a good rest and recharge in a spectacular landscape surrounded by two rivers, the Cabriel and the San Martin, which invites you to enjoy hiking and active leisure in touch with nature. To do this, guests can Cabriel Winery Inma have to get the information and assistance they need. It has 8 double rooms (superior and standard) and a quad (two beds) with a possibility of extra beds or cots. Our superior double bed have extra large and the standard two beds (one adapted for the disabled, located on the ground floor). All rooms are exterior and are equipped with bathroom (bath or shower), desk and LCD TV. Living room with fireplace equipped with board games and small library available to guests, air conditioning in public areas, bar-cafeteria and restaurant, garage and ample parking. Bar , Newspapers , Garden , Terrace , Non-Smoking Rooms, Rooms/Facilities for Disabled Guests, Soundproofed Rooms, Heating , Luggage Storage, Designated Smoking Area , Restaurant (à la carte) , Snack Bar . Sauna , Fishing , Games Room, Solarium , Spa & Wellness Centre , Massage , Children's Playground, Hiking , Indoor Swimming Pool. Policies : Free! One child under 12 years stays free of charge when using existing beds. What to see & do : You can visit Cuenca City, Hanging Houses, Enchanted City, Glen Lakes Hole. Ideal area for hiking and enjoying nature, stunning landscapes bordered by the waters of the river Cabriel, the cleanest in Europe. - Take the A3 towards Valencia. In National Highway Tarancon take take us to Basin. 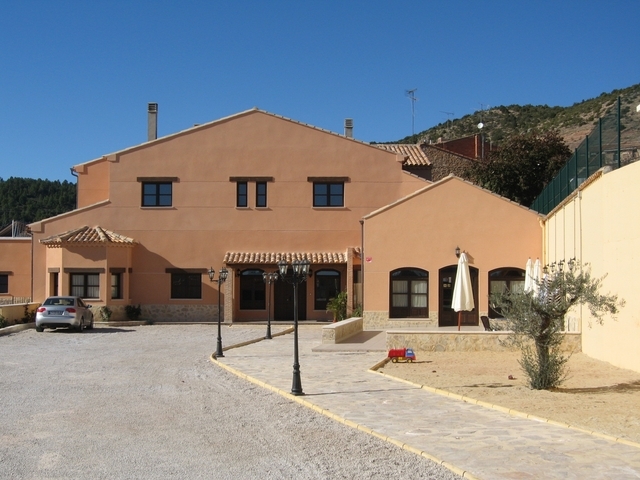 Without entering the city and through the bypass take the National Highway Teruel. Follow this road to Carboneras de Guadazaon, there we will take a detour to the CM-2109 and Utiel Cardenete direction. From this crossing Villora is 30 kilometers. We will pass through and reach Villora Cardenete. The house is accessed from the same road and is the last building (Salmon) to find our right. - Take the A3 towards Madrid. 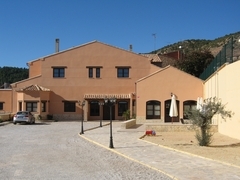 In Utiel leave the motorway and drive through the village towards Camporrobles or cellar "Hoya de Cadenas". Once through Camporrobles, while the same road, we will find the sign that signals the entry into the province of Cuenca. It's the same road, now called CM-2109. No cross look and will leave for 20 miles to Villora. Now the house is located to the left and is the first building that we find on this side of the road.